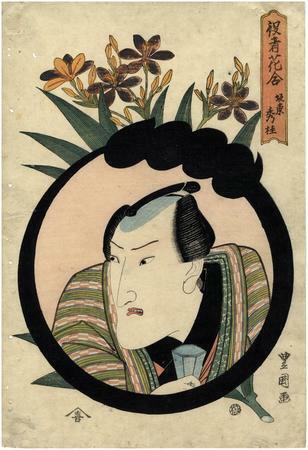 Bandō Mitsugorō is portrayed under his poetry name within a large black toshidama below dramatically oxidized orchids. There are 5 other prints in the Lyon Collection showing actors portraits enclosed by large toshidama motifs. Those are by Toyokuni III and were created about thirty plus years after this example. (See Lyon Collection #s 1573-1577).